Our visit was welcomed by a soft “irasshaimase” as we approached Miyama Café inside the Takashimaya Saigon Center mall (L3-01, 65 Le Loi, D1). We settled in soft fabric seats, at a table of pale cedar wood, soothed by the minimalist Nordic-style interior. To quench our thirst we opted for some deluxe fruit drinks (VND198,000). These were made with fruit harvested at peak season then flown to Vietnam. The Japanese melon drink was wonderful—sweet, aromatic and ice cold. The Provence pear drink tasted like sunshine in the French countryside. and Ni Set E (VND328,000) with steak sukiyaki. The side that most impressed came from Ni Set D, juicy pork and scallop gyozas served in small steamer baskets. 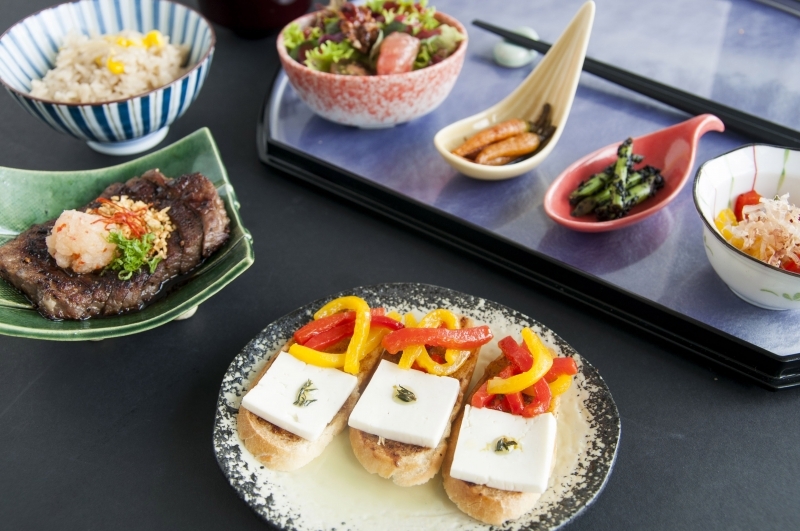 The sides included some well-chosen international influences, such as the roasted red pepper and feta bruschetta in Ni Set E.
The salads at Miyama deserve special attention. 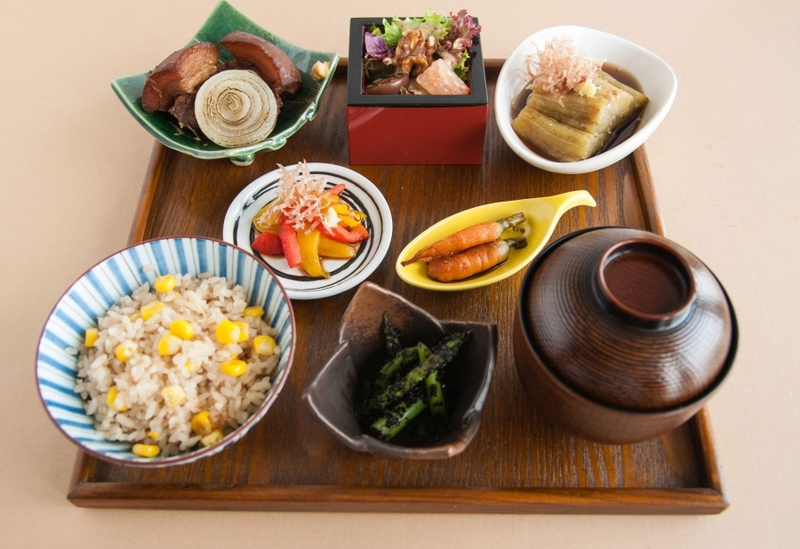 Large enough for a light meal, they are made with four types of vegetables, sourced from Miyama’s very own farm in Dalat. Diners can select chicken, shrimp or salmon, grilled with seasonings like Japanese teriyaki sauce or Jamaican jerk spices. The dressings enhance this international fusion, with options like raspberry vinaigrette, Asian ginger sesame or Mediterranean tzatziki. 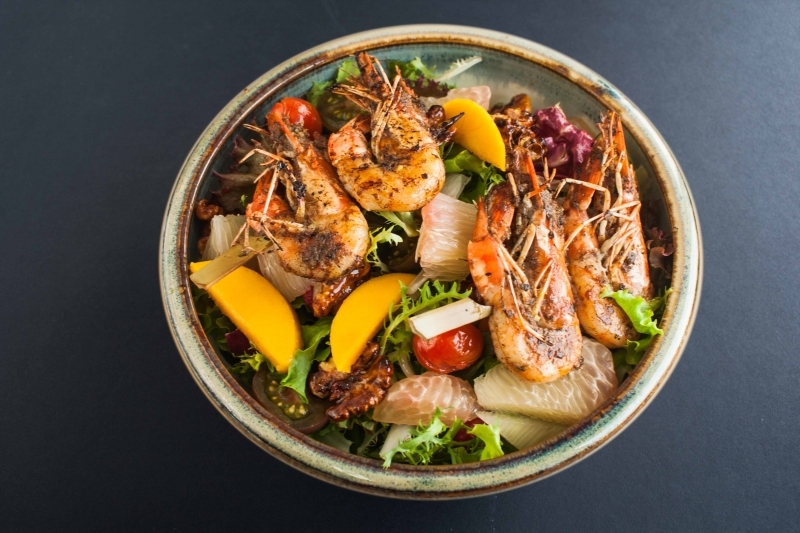 Our big jerk salad arrived with freshly grilled shrimps (VND238,000), cherry tomato confit, cucumbers and punchy black mint leaves. The mains here are as light and balanced as the Japanese cedar trays they are presented on, intended to leave you satisfied but not stuffed. In traditional Japanese tea ceremonies, a small meal called ichiju-sansai is served, to leave participants with room for tea. 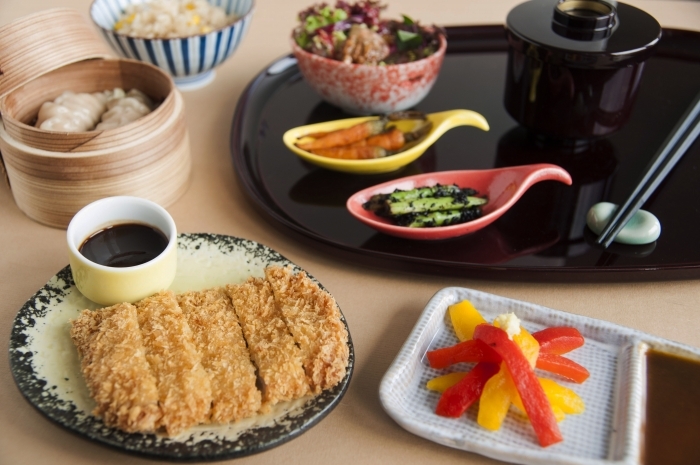 Miyama also offers ichiju-sansai sets, which include a choice of full dessert. And indeed, the tea and dessert menu is truly spectacular. There are towering French pastries and homemade ice cream. 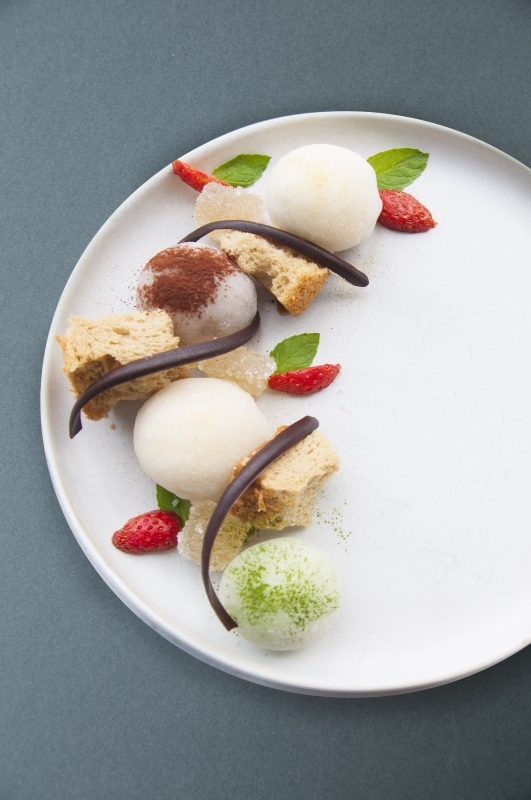 The pastry chef was trained in Japan, and the premium matcha is imported straight from Kyoto. We indulged in a selection of Japanese mochi (VND218,000) and the maple chiffon cake (VND98,000). The mochi is made fresh daily, and had an ideal chewy texture, an indication of the skill and patience required to craft them. Each mochi was filled with a rich cream in a different flavor: Matcha, kinako, Valrhona chocolate and yuzu. Our chiffon cake was not to be outdone. Soft and cloud-like, its subtle sweetness and strong maple aroma paired perfectly with whipped cream. 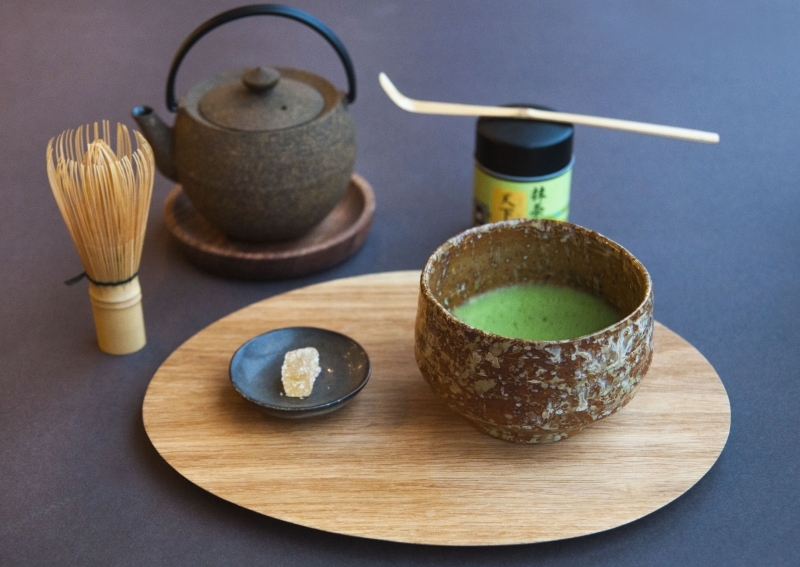 If you haven’t experienced a Japanese tea ceremony, this is the perfect informal introduction for you. Finely ground matcha powder and 75°C water are beaten with a bamboo whisk. The resulting cup is a layer of bright green foam over a strong drink that is nutty, bitter and sweet. Drink it like an espresso, in small sips. 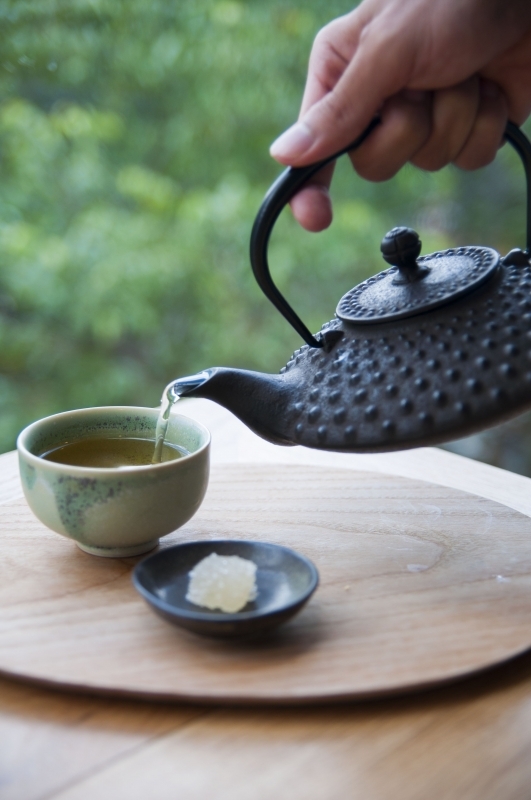 The Japanese word umami is used to describe rich, even meaty flavors, and you can taste this in the tea, as well. For anyone interested in specialty coffee or chocolate, Matcha should be on your list. 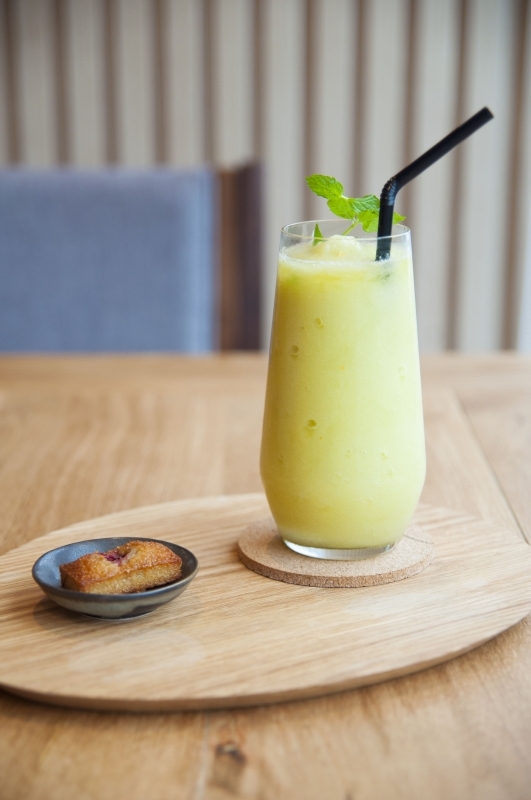 Beginners can opt for the oi-matsu matcha (VND198,000), a drinkable blend of asahi and gogou leaves. Matcha enthusiasts can treat themselves to the tenka-no-mukashi (VND398,000) featuring pure asahi leaves. The tenka-no-mukashi has such an ideal balance of umami, sweetness and bitterness that it is ranks among the best in Japan. As it sits in a sharp corner of Saigon Center’s second floor, any seat in Miyama affords unusually verdant views of the treetops on Pasteur Street. “Miyama” means “beautiful mountain,” and in the light cool space we indeed felt as if we were on a snowy peak gazing down on the urban landscape below. One could spend a pleasant afternoon here, ordering trays of coffee and sweets. Or you could take a culinary dive into modern Japanese cuisine for lunch, or try a tea ceremony at the spacious marble bar. Whether you’re impressing friends, or just yourself, go to Miyama Café.